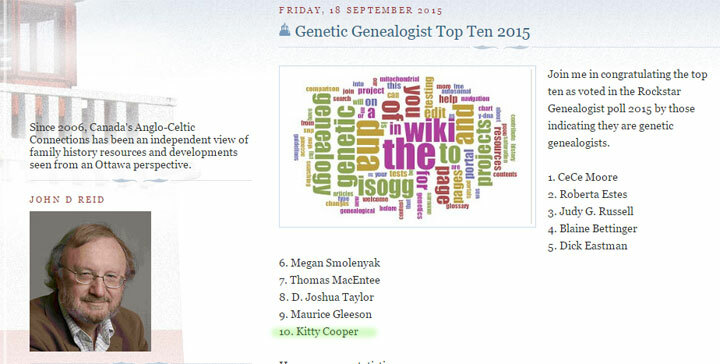 Thanks to all of you I slipped into the 10th spot in the top ten rockstar genetic genealogists list. This makes me extremely happy. I did nothing to promote myself since I did not think that I deserved this honor and also this was my first year on the ballot. So I will do my best to continue to bring you “how tos” and posts about new tools and features as well as write a few more tools myself. Stay tuned and thank you all so very much. Congrats! Kitty, you are among some wonderful winners and you deserve to be there! Hey Cousin! Congratulations. And thanks for all you do for all of us!